Hope everyone is well! Happy Friday! 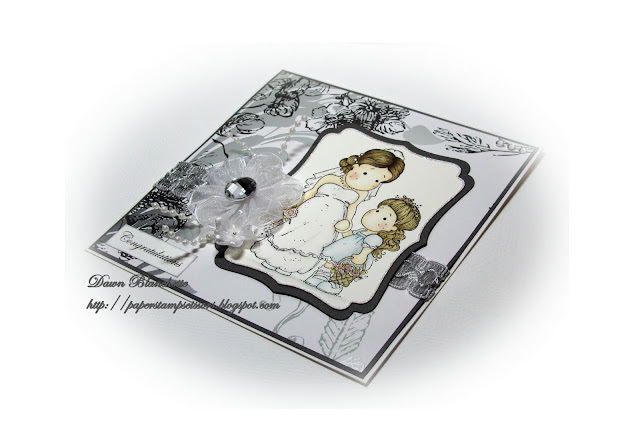 That means it is time for a brand new challenge over at Crafty Catz! 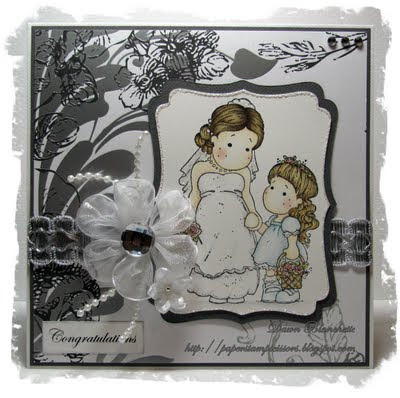 This week, the lovely Trish is hosting and she has chosen a Congratulations theme. So, we want to see your congratulations related projects - it could be for anything from a new job, birth, wedding, retirement, big birthday, etc. 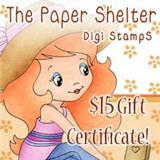 Our fabulous sponsor this week is The Paper Shelter and a $15 gift certificate to their store is up for grabs for one lucky winner! Hope you are able to join us! The ribbon flowers were sewn by hand. I was planning on including a tutorial to show how I made them, but unfortunately I ran out of time. I love how they turned out, though, so I will definitely be making some again soon and will include a tutorial﻿ then, promise. 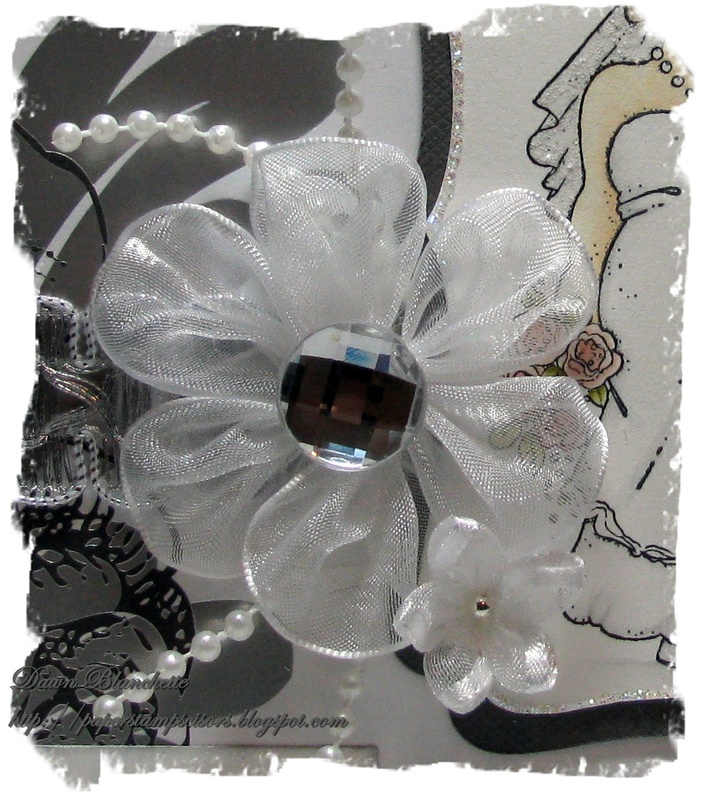 The big shiny centre on the larger flower is a Timeless Bazzill button. Thanks for stopping by and for taking the time to leave a comment! Hope you enjoyed my card - I can't wait to see yours! Your Wedding card is gorgeous!! Your hand made flowers are wonderful. I will be waiting for your tutorial. Dawn, what a gorgeous card. And how appropriate..LOL..yup, I stayed up and watched the royal wedding--3:00am my time! Love this image and you've coloured it beautifully. I'd like to give distress ink a try. Wonderful how you've kept the focus on the image and left the rest in B&W. Beautiful DP. Your hand-sewn flower is gorgeous. Your card is gorgeous and this image so lovely! This is a stunning card. I love that image and the Mono colour is just fab. Got a elegant feel to it! That flower is gorgeous! Thanks for joining us at Craft Us Crazy for our mum/flowers challenge! 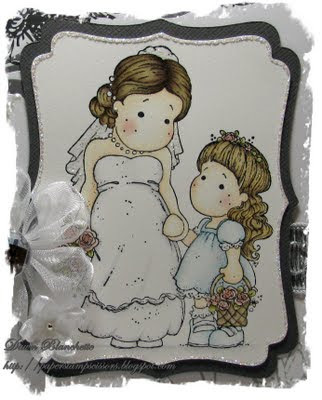 Such a sweet card. Love your coloring and the color combo..one of my faves! beautiful work! !